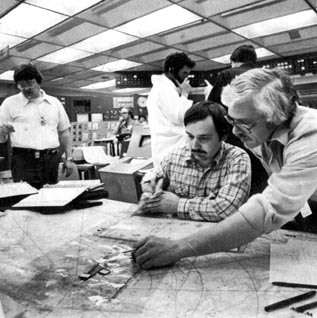 4:00 AM: Due to equipment failure and operator error, a partial nuclear core meltdown of the TMI’s Unit 2 reactor, the worst nuclear plant emergency in United States history, occurred. Conflicting reports from various sources, including the utility and its regulators, made it difficult for others, including state officials and journalists, to assess the situation..
That day the Nuclear Regulatory Commission (NRC), the federal oversight body for all nuclear plants in the United States, sent assistance from both its regional office and from Washington D.C. Metropolitan Edison (Met Ed), a subsidiary of General Public Utilities (GPU) asserted “Everything is under control,” though many at the plant had doubts. Please visit our Industry page to learn more. That afternoon Lieutenant Governor William Scranton Jr. told the public that the situation at the plant was more complex than at first thought. Two Members of A Television News Crew confer. National and local news coverage was intense for several days following the accident. Two TMI Radiation Technicians check wind speed and direction during the accident. Measurements such as these helped determine the amount of radiation released. The clips of Richard Thornburgh are exerpted from his Three Mile Island Twentieth Anniversary Address, delivered at Dickinson College, March 25, 1999.